The outer edges of the Milky Way’s appear to be orbited by innumerable invisible galaxies. Three bright pulsating stars on the outskirts of the Milky Way galaxy could be beacons from an invisible dwarf galaxy that astronomers predicted was there based on its effects of galactic quakes in our galaxy. These galactic quakes, ripples in gas at the outer disk of our galaxy, have puzzled astronomers since they were first revealed by radio observations a decade ago. Now, astronomers believe these stars mark the location of a dark matter-dominated dwarf galaxy far beyond the edge of the Milky Way disk, which terminates at 60,000 light-years. The research, led by Sukanya Chakrabarti of the Rochester Institute of Technology, presents the first plausible explanation for the galactic ripples. “It’s a bit like throwing a stone into a pond and making ripples,” said Chakrabarti. Astronomers discovered the first evidence of mysterious dark galaxies with no starlight in 2005 – VirgoHI 21 – a cloud of hydrogen in the Virgo Cluster 50 million light-years from the Earth was found to be colliding with our galaxy. Virgohi 21 revealed its existence from radio waves from neutral hydrogen coming from a rotating cloud containing enough hydrogen gas to spawn 100 million stars like the sun and fill a small galaxy. The rotation of VirgoHI21 is far too fast to be consistent with the gravity of the detected hydrogen. Rather, it implies the presence of a dark matter halo with tens of billions of solar masses. Given the very small number of stars detected, this implies a mass-to-light ratio of about 500, far greater than that of a normal galaxy (which would be around 50). The large gravity of the dark matter halo in this interpretation explains the perturbed nature of the nearby spiral galaxy NGC 4254 and the bridge of neutral hydrogen extending between the two entities. According to her Blitz, searching for satellite galaxies with this method is like inferring the size and speed of a ship by looking at its wake. “You see the waves from a lot of boats, but you have to be able to separate out the wake of a medium or small ship from that of an ocean liner,” he says. The models Blitz developed in 2014 predict that the universe should contain far more dwarf galaxies than the tiny fraction that astronomers can identify. To pinpoint any dark galaxy hot spots, Blitz and his research group are mapping the structure of the Milky Way. In the process, they have been able to characterize the warping of our generally flat galaxy: “It’s like hitting cymbals; it’s held in the middle and the outer parts are free to vibrate,” he says. “That’s exactly the kind of signature we look for if the Milky Way were being hit by these dark matter galaxies,” he says.As promising as the mapping looks, Blitz is hedging his bets with a second approach: seeking gassy cores that could be embedded even in dark galaxies. The resulting map of interstellar hydrogen could help answer another paradox in astronomy: why today’s galaxies haven’t yet run out of gas. According to observations, most galaxies have just enough fuel left to make stars for another billion years or so. Yet galaxies have endured for most of the age of the universe, making it unlikely that so many should blink out at once. 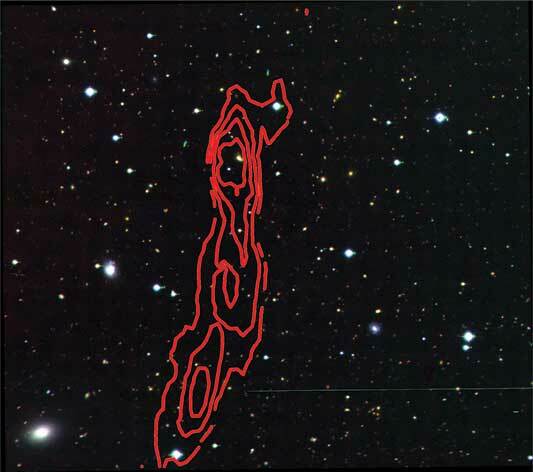 The image at the top of the page shows contours of HI column density obtained from the ALFALFA observations of the field around VirgoHI21 and NGC 4254 superposed on an optical image. The HI tail extends from NGC 4254 (visible in the lower left) more than 250 kpc to the north (assuming it lies at the Virgo distance of 16.7 Mpc).